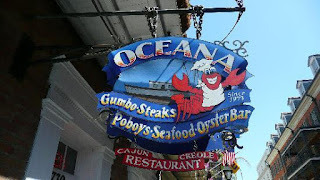 In this Kitchen Nightmares episode, Chef Gordon Ramsay visit's Oceana, New Orleans, LA, a sea food restaurant owned by brothers Moe and Rami. The brothers have an explosive relationship, the restaurant is dirty and has vermin. Gordon speaks to the waiter and discovers that they fire a lot of staff, he has been fired 4 times! Gordon orders the Seafood Gumbo, Crab Cake Platter and Blackened Bayou Duck. The gumbo is disgusting and tastes old, the crab cake platter is soggy and the duck is tough. Rami agrees it is tough but Moe disagrees and eats it himself. The chefs deny that the crab cakes are frozen but owner Rami tells him they are and the duck was cooked a month ago. Gordon oversees a dinner service and walks into a kitchen full of smoke. The warmer unit is not even hot, the crabs are milky and there are very old prawns that make Gordon retch/vomit. The crawfish and pasta is cooked days in advance and he then finds a mouse trip with 3 dead mice in. Gordon shuts down the restaurant based on what he has seen. Gordon calls in the exterminators when a live mouse runs out and after he finds out they have never had a proper clean, the staff start deep cleaning the kitchen. Moe starts shouting at Rami as he blames him before shouting at the servers, throwing chairs and downing shots. Executive Chef Damon is sacked. and as Moe has all his recipes in his head the chefs have no idea what they are meant to be cooking. Gordon starts by revamping the menu as Moe offers no recipes and Gordon teaches them a blackened salmon special. The owners allow Gordon to make whatever changes he needs to make. Gordon gives the dining room makeover with a fresh lick of paint and a decluttering. They sample the new menu and Moe likes it! On Relaunch night, Rami is supervising the kitchen and Moe running the front of house. Moe abandons the front of house and hovers around the kitchen and has to be sent back out. The customers are liking the new menu and Moe appears back in the kitchen, moaning about the speed of the food. Moe walks out and Gordon goes after him. Gordon leaves and is unsure if Oceana will still be there when he revisits. Oceana Grill restaurant is still open but with new owners. After filming, online posts seem to suggest that nothing had changed, the decor didn't look different, unhappy customers were still shouted at and the menu was mostly the same too. A lot of the staff featured in the show had left. Yelp reviews and Trip Advisor reviews are mostly good, mostly done on mobiles, there was rumoured to be a promotion whereby you got a free drink for a review on Trip Advisor. Thinking of visiting the restaurant? Check out their website for opening hours and more info. They can also be found on Facebook. Oceana Grill was aired on May 20 2011, the episode was filmed in January 2011 and is Kitchen Nightmares season 4 episode 12. After catching up on back shows, and watching this episode, the smartest thing Rami could do is buy out Moe, the guy isn't all there, now to be fair, some of it i'm sure is editing, but the way he's shown on the show, like saying he wants the shrimp salty so they will buy more liquor, really make him look like he's not all there and doesn't know a thing about running a resturant. Damn, I was thinking the same thing, He should completly get rid of him, then he can start anew for real. I've watched some recent videos on YouTube with Rami still the owner but no Moe. The restaurant seems to be doing good with good reviews. Of course the reviews could be manipulated to show as mostly positive reviews. But Yelp has an average of 4 out of 5 stars. Will have to stop by there the next time I'm in town. Im deeply surprised this restaurant is still open... Good AND bad. Rami being a great owner and trying his best. However, Moe is terrible at everything except intimidation. Hope all goes well for them either way. I was just there with my family this past weekend and the food was very good. I'm born and raised in Southern Louisiana and I don't just eat Creole/Cajun cuisine anywhere. We were pleasantly surprised even went back the next morning for slammin homemade pancakes. It looks like the owners took some of the criticism to heart and revamped their restaurant. According to their web page, Moe is not mentioned at all, and they have a new owner, with Rami still there. It looks great. I don't live near it, so I don't think I'll be going anytime soon. the "owner" hasnt changed. take a look at the family name of the owner. perhaps you would be enlightened. I ate there last night and I loved the food, it was absolutely delicious. Most of the food is bought frozen from Sysco. Reheated food never tastes good unless you throw some sauce on top of it so you can't tell. Too many NO restaurants are doing this as well. Find out the background of the chef to make sure the restaurant you choose leaves you with an experience you want to remember. Tripadvisor has some posts saying that Oceana Grill has reviews that have only one post and are new accounts. Unusual for a small restaurant to have so many reviews. I think they are doing it to counter the above article. Come on. Moe is still there. Just laying low. Wouldn't you? I was in NOLA not long ago and Oceana is advertising like crazy. You see their signs everywhere. That said, there are a ton of shyster fake restaurants in the Quarter that prey on tourists who don't know better. I would never set food in there. It's a stone's throw from legendary restaurants filled with real history. I know there are rat's in the filthy place it's a huge tourist town. Most who eat there are from out of town and they're drunk out of their minds. So they don't really know if the food is clean, or good. . My grandson worked there and he said Moe, and Rami ar assholes. The kitchen has tons of rats in the food. So if you eat there, be sure you're drunk out of your mind. I've been there many times. All the staff was extremely friendly, the place was nice and clean, and the food was awesome. It has the best gumbo I've ever had, as well as the red beans and rice. I don't understand the difference in my experience with everyone elses. Maybe I went at an earlier time? I don't know, but I love it and I'll continue going every time I'm in New Orleans. I know both Moe and Rami, I worked for them a couple years back. Moe is still there, he may not been seen as much but trust me, he is there and loud as can be when he is. Rami is not a bad manager, it is a shame he is in the kitchen so much because unlike Moe, Rami actually knows how to talk to his employees. If Moe wasn't still there I would attempt to go work for them again. He is still rude as can be. I can tell you from friends who have been there since this show aired that it hasn't changed a bit. A friend of mine was there the night it reopened, and went back two months later, she said it was nothing like the last night Ramsay was there. She sent her pasta dish back because it was cold and Moe came out and started yelling at her asking her if she thought all they did was serve cold food. This place is a tourist attraction, in the heart of the FQ that is the one and only reason it is still open. Those of us who actually live here rather take our business else where, to places to don't serve Restaurant Depot food, yeah that's right, a lot of it isn't even sysco anymore, Restaurant Depot to cut down the costs! I went there and had the best Oysters Rockefeller & Crab Cakes I have ever had and the staff was friendly. Moe is an alcoholic. Even in Ramsay episode, he slips off to drink and comes back wasted. You can tell from how passive he is after he disappeared but yet still 'out of it'. It is not directly mentioned but Chef Ramsey, says something along the lines of '... can't be here just for the party..'' insinuating Moe's drinking without directly calling him out. Shame, a good waste of an opportunity. Yeah I picked up on the slurred speech as well. "Busy idiot is a complement..." was the most hilarious thing I've ever heard, with "my reciepes are kept in my head" a close second. I would not eat at this restaurant to save my soul. Moe is a functionally mental case. Bugs Bunny said it best..."what a maroon". He was at the "I luv you mate" stage of drunk. Man, they should've done a two-parter on this. There was so much they kept hinting at towards the start of the ep, as well as throughout, that must've just wound up on the cutting room floor because of Moe's antics being just too hilarious. The main thing I thought was missing was the financial part. I almost felt like I was watching one of those KN eps that was made just so there'd be a restaurant they could guarantee would still be open in a few years, like people have suspected about the Curry Lounge from UK Season 5. I mean, their rent has to be insane, and they even knocked through and had expanded from when they'd gotten the place from their dad. Plus they were talking about how closing that one night cost them $5K. The other thing they just left alone despite setting it up was the staff turnover issue. I almost felt like I was starting to watch the Amy's Baking Company ep when they teed that up. They actually own two other restaurants on Bourbon St as well. They seem to be doing really good to me. We just went to this restaurant in Sept 2015 and the food was delicious. We were not offered drinks for reviews at all. I can see how the restaurant is still open. They must have taken some of the criticism to heart and made improvements. "Busy idiot is a complement..." was the most hilarious thing I've ever heard, with "my recipes are kept in my head" & "He's British ..... he doesn't speak English". Can someone really be that stupid ? It seemed it wasn't just Moe who was a major problem. That chef Damon was psychotic too - prejudiced, confrontational, sweating and constantly blinking in a very disturbing way! I loved the contemptuous way Ramsay called him 'chef' when he said: "And how many crabs are you selling...?" and ripped into him for the horrific hygiene and food safety standards! I will say I do not eat seafood. Spent a week in Nola and wanted a steak. The last night we were there that is where we ate. I had the best rib eye I have eaten in forever. The M.Pot. where delicious everyone else had seafood and said the food was great. We sat outside in the patio and the decor was loevley. When we left the line was down the block waiting for people to get in. Unfortunately the way Nola is set up it is very hard to control the birds and vermin I'm sure. Everything is open. Thousands of people don't make it any easier. I have been in the rest. Business essential my entire life and can say I'm one of a rest. Worst customers bc my expectations are very high. Best food I ate the entire time I was there. I may be wrong, but Moe seemed a bit... under the influence of an unknown substance, all throughout the end of this show. OOOH and his suggestion to grab a drink after just sealed it. Hmmm. Either way, I'm glad it's still open. It's Louisiana, right?!?!? This is so sad. I ate there in 2008 and it was amazing! I realized that the ownership changed over later on that year. So sad it went downhill. Did anyone else notice Chef Andi towards the end? Okay yeah...the Yelp reviews are super suspicious. I have never seen a restaurant consistently get SEVERAL 5 star reviews almost every single day. I am inclined to believe the free drink for good review trade. I mean come on....even really wonderful restaurants do not get floods of 5 star reviews every single day. I want to see if I can find anyone to confirm the free drink thing, because the more I dig the more suspicious it looks. I hope Ramsay returns to this restaurant at some point for a follow-up. Maybe in his new show said to be a rebooted kitchen nightmares? Outside of all of Moe's problems and aggression, pretty much every other owner on this show could learn from how he handled firing Chef Damon. He clearly listed off the reasons why Chef Damon was being fired without getting personal, and made it extremely clear that he was being fired. After so many episodes where people handled firing a bad chef by beating around the bush or using euphemisms, it was refreshing. I'd love to see Rami just buy out the whole place from under Moe, because Rami seems not only competent but good-willed and professional. But I get the impression that what we see between them is what their relationship as brothers has *always* been: Moe being dim or belligerent, and Rami looking after him and calming him down. That dynamic probably started when they were little kids, and the main reason Rami doesn't leave or buy Moe out is because he feels obligated to that fraternal bond. There's something to be admired in that, but it's not doing Rami, Moe or Oceana any favors. EVERYBODY SHUT UP! OCEANA HAS THE BEST FOOD AND ALL THOSE OTHER RESTAURANTS JUST STEAL MY RECIPES OUT OF MY HEAD. WE NEVER PAY FOR GOOD REVIEWS. WE JUST HAVE THE BEST FOOD IN NEW ORLEANS. THAT DUCK IS THE MOST DELICIOUS THING YOU WILL EVER TASTE. I WILL FIGHT ANYONE WHO DISAGREES!!!!! My friend and I went to Oceana for lunch on a Monday at 11am. We had the crab cakes appetizer, the fried seafood platter, the taste of new orleans, and the kentucky bourbon pecan pie for dessert. The food was delicious and our waitress was fantastic. I would definitely go back again! I had the duck 2 weeks ago - it was absolutely awful and tasted frozen - nice try moe - but I'd keep your life's frustrations out of your restaurant for your sake. They're still open 7 years after this episode. I had a good laugh when I found it on Youtube because they're my favorite restaurant in the quarter. I'm from NO and have eaten at every restaurant there and I like them best. I have probably eaten there 50 times and consider it delicious. Rats, bugs, bad tempers, dirtiness, everyone being drunk at their job and getting fired/rehired are simply how things are done in NO, unless you're eating at a 5 star restaurant or something. If this ep made you worry, lol you don't want to know the level of filth going on in the bars, that's for sure!